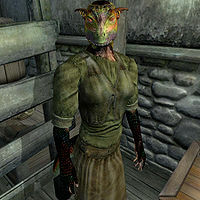 Bejeen is an Argonian commoner living with her hunting partner, Weebam-Na, in one of Leyawiin's shacks. They are known for running scams together, but, according to townsfolk, she wasn't a bad sort before she hooked up with Weebam-Na. Her involvement with him seems to have landed her in a bit of trouble with the Saint of Suspicion. She wears lower-class clothing which consists of a stitched green shirt, belted braies, and pair of stitched leather shoes. She also carries her house key and a small amount of gold. Bejeen lives a very simple life, and spends literally all of her day wandering around Weebam-Na's house, never stopping to either sleep or eat. When spoken to, she will introduce herself and also tell you a little about Weebam-Na: "I'm Bejeen. I'm a hunter, and Weebam-Na's partner. I hope he didn't bother you about the rat thing. He's gone totally rat-cuckoo, I'm afraid." Asking her about Leyawiin will prompt a response about the rat problem in town. "Maybe Weebam-Na told you how we got all the rats here in Leyawiin? It's not so bad. He's been killing them for months." When you start searching for the eye of Nocturnal, rumors will point you in the direction of the two hunters. Asking Bejeen about the eye will prompt a very suspicious response: "Why... why would you ask? I've never heard of it. No idea what you're talking about. And Weebam-Na doesn't know, either." Once she is assured that nobody is nearby, the two start to talk about the eye. She is obviously not confident about its safety, and has many concerns about their treasure. "But what if the trolls eat it?" is the first of her worries. After her partner reassures her that trolls can't swim, she then questions, "But what if a fisherman uses the cave?" Apparently she is so insecure about the eye's location that she resolves to retrieve it. Weebam-Na disagrees however, and dissuades her from it. After being told it is perfectly fine where it is, she will tell Weebam-Na, "You're right. I know. I'm just worried. I'll try to calm down." Asking Bejeen about Tidewater Cave then sparks a defensive reply: "I... I know nothing of the place. Just an old cave, from what I hear." Bejeen will never sleep as the conditions for her to sleep require you to be on stage 50 or greater and on less than stage 5 on the Mazoga the Orc quest which is impossible. It is likely that the developers meant to use or rather than and. This page was last modified on 15 March 2017, at 20:48.